A lively last show at Mahers - Diana "giving it laldy"
"The Summer's gone, and all the flowers are dying"... an uplifting quote from the song Danny Boy to start us off - hahaha!. Hello! I hope you have all had a great Summer. Here in Portland, OR it has slipped quite suddenly (as of Tuesday this week) into sheets of rain and cold - so it is time to wrap up our visit here for 2017 with two fine last Pacific Northwest events. 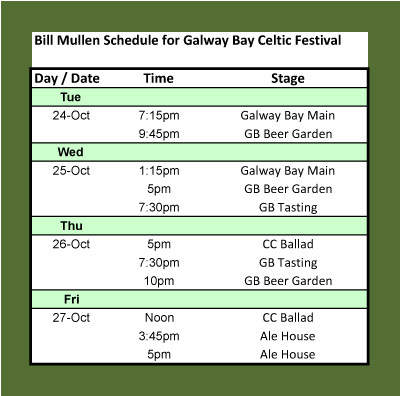 The first event is the 14th Annual Galway Bay Celtic Music Festival which starts Tuesday October 24th up in Ocean Shores Washington. This is a mega- event, over 30 different musical acts descend on this sleepy oceanside town to perform for 6 days for thousands of Celtic music fans. It is incredible and it will be my 3rd year performing there. I have developed a good following there. 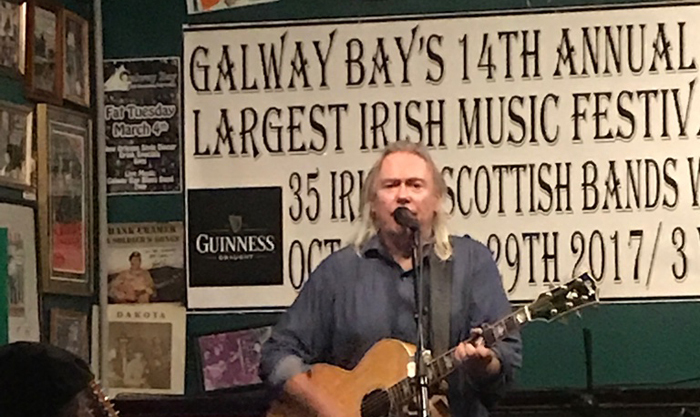 When I appeared at the Galway Bay in August I found a large group of folks who have been at my shows waiting for me. That was very nice and well appreciated - thank you to those who were there and to Showell & Nancy for the great brunch!! This year I am very excited to welcome Lisa Gomes, the great fiddle player I met in Honolulu to join me on stage for some songs during my performances. 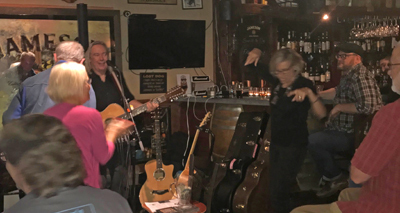 Lisa plays tirelessly in Bill Comerford's wonderful Irish pubs in Honolulu keeping the Celtic music scene alive and well. Lisa was my guest fiddler on the track "No Reels or Jigs on Sundays" on the album "Mullen it Over". In 2015 & 16 at the festival, I was pleasantly surprised to find that a lot of the same people come to each of my performances. I therefore decided to avoid repetitions of the same songs, so I arrange all of my Irish and Scottish songs (about 90) into unique hour-long sets (I will also play requests). This was very popular last year - it does give me a lot of extra preparation as I "blow the dust off" songs I seldom play... and make sure I can remember the words - to my own songs !! Spare a thought for Lisa, who is practicing like crazy in Hawaii using my CDs and videos I have sent her with the songs we'll play... while working hard during the day on her real job! 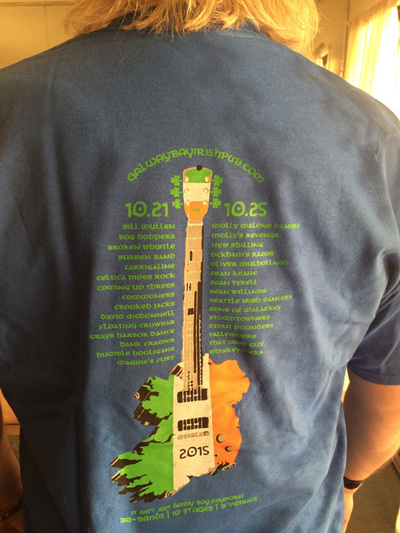 I couldn't resist just one more gig - in the new Irish pub in Portland, T C O'Learys on Monday October 30th (7:30pm). This will be a good wrap up and chance to let rip one more time before we head off. It is a great wee pub, run by Irishman Tom O'Leary and his wife. The beer is great - a lovely selection of the finest craft beers and the food is delicious, a small menu with excellent daily specials. I'm hoping we have a great turnout as I want people who like my music to like this pub... it's a great find and well worth regular visits! On Wednesday Nov 1st we head off overland with our house on wheels, south then east to arrive in Florida mid-November. I'm not playing shows en-route this time, we're keen to start enjoying the winter sun in Florida. In my last update, I had just returned to Portland and was enjoying meeting old friends, renewing acquaintances and playing nice events. I'm happy to say that has continued all Summer and I have now played some great shows while I've been here. 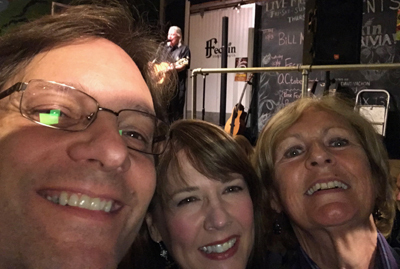 The Feckin brewery on Friday October 13th was brilliant, we had a big crowd and I introduced their new beer "Dia de los Muertos", in honor of the Mexican celebration "Day of the Dead" (which I experienced in San Antonio in 2014 ). It is gorgeous! A black stout with Horchata, Coffee, Cinnamon and Paddys Whiskey! ... wow!! You have to try it... somehow! My last Mahers show of the year was Saturday October 14th. This was just like old times, a nice crowd of friends and familiar faces who showed up to enjoy another great Mahers experience. It was a joy to play there and the energy in the room was electric... it kept me going for three hours with just a wee (wee) break. Oh - the BIG desert was a treat from Mannys chop house, FL our 39th anniversary!! One of the fun things we did this summer was to visit our son Kyle and his wife, Lauren in Wisconsin. That included a big wedding-type celebration for those who couldn't make the celebration in February... and for those (like us) who just enjoy a good party. It was organised at Lauren's parents, Keith and Connie's house and was a great day. At the end of that great day, Kyle and Lauren gave us a huge surprise when Lauren appeared in an "Ice Ice" T-shirt with an arrow pointing to her tummy... it took a wee while for us to complete the title with the word... "baby" !! We were blown away. We are delighted at the prospect of becoming grandparents in April. 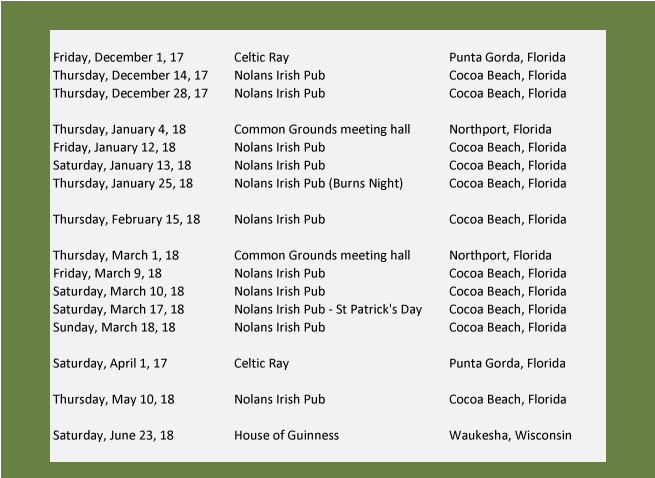 I'll be putting some time into establishing a nice circuit of places to play in Florida as I will be there every winter for the forseeable future and with our wee one expected up in Wisconsin next year, I anticipate several trips to the Milwaukee area - so I will be looking for summer gigs in Wisconsin. I will of course stay loyal to my folks in the Pacific Northwest, Scotland and the Netherlands and plan to return for more great times there. Watch this space to see how the travel plan develops.